Hello there! Kayla, Bill, and Luna here! Today, our cat Luna would like to take over and talk about his incredible life (both on and off the open road). As all pet owners know, it doesn’t take long before your “little baby” turns into a “big baby”. I feel like Luna grew four sizes in the blink of an eye! Luna first entered my life as a wee kitten. 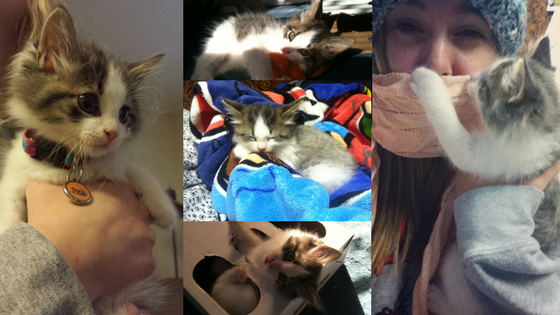 He was the runt of his litter and could fit into the palm of my hand (believe it or not). We had an amazing bond from the start. 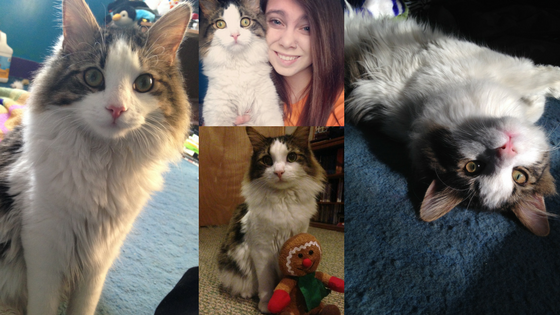 We played together, chased each other through the house, went outside together, and even snuggled together at night! 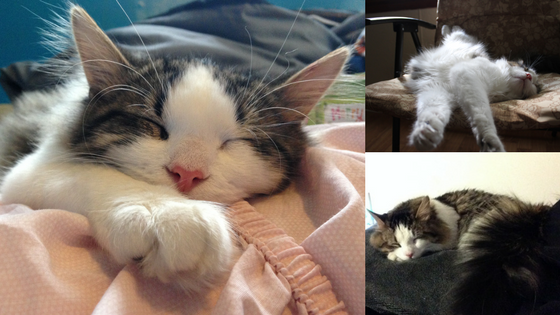 There was just one problem with Luna… it took three vet visits to find out he was a boy. Yep, you read that right. Three! I was as shocked as Luna to hear this. The first two times I took Luna to the vet, I was told that he was a “she”. 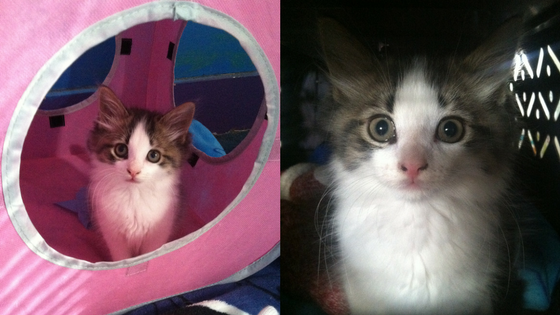 Around the time of the first vet visit, I was bouncing between names (Luna for a girl and Clyde for a boy). Let’s take a moment to thank the veterinarian for telling me he wasn’t a boy right off the bat. He doesn’t even look like a Clyde! Luna stuck by the time we went to the vet for the third time and I figured it was a good name for him, anyway. 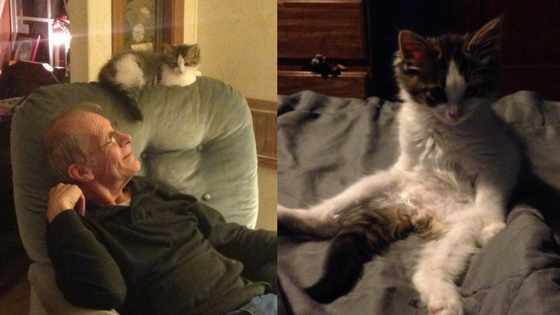 Luna had a tough time fitting in with my family at first (more specifically, my grandpa). He was not happy that I brought Luna home and didn’t talk to me for days. One afternoon (maybe a week or so later), my grandma and I went to Walmart to pick up some things for Luna (food, toys, etc.) and my grandpa said he’d “Keep an eye on him” for us. When we returned from the store, my grandma and I were astonished to see them sleeping together on my grandpa’s armchair. 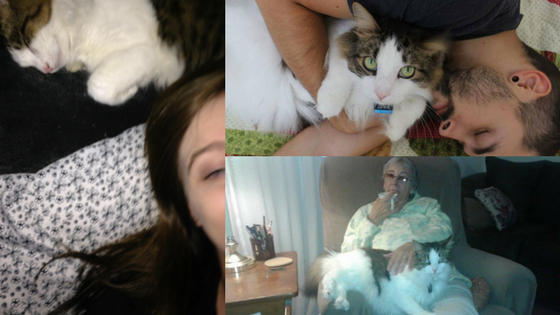 My grandpa said that Luna could stay with us but made sure I knew he was my responsibility (and mine only). It was settled. Luna was officially part of the family (and I couldn’t have been happier). 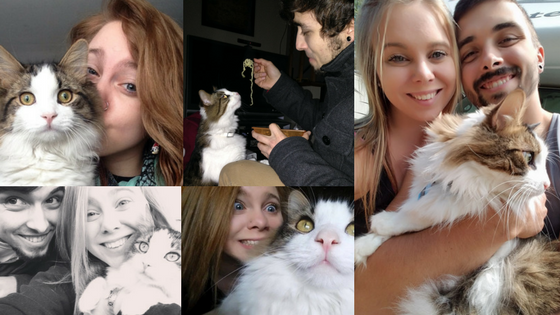 Needless to say, Luna fit in pretty well with us humans. Luna had always been an indoor cat. 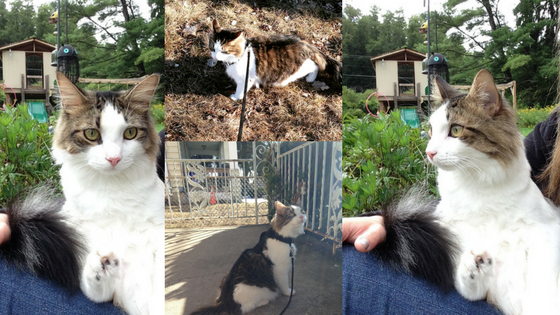 I had no desire to take him outside because I was afraid of losing him. Mainly because he runs extremely fast and I was always worried that he’d run away. After all, you know what they say, “Curiosity killed the cat”. But, how could you resist this cute face as he was gazing out at the birds? I knew that I had to let him explore outdoors. The first few times we went outside, I was anxious. Luna was very interested in birds, but to my surprise, he never chased after them! Well, scratch that. He would chase them, but when he got close to them and they flew away, he ran into my lap as if he was afraid! After a few outdoor excursions, my anxiety withered away. He was on a leash and we trusted each other to stick side by side. Thus began the days of Luna the travel cat. 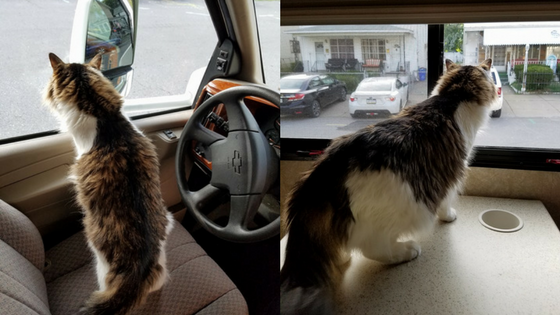 When we first purchased our RV, Bertha, we brought it to our apartment and allowed Luna to fully investigate his new home alone. 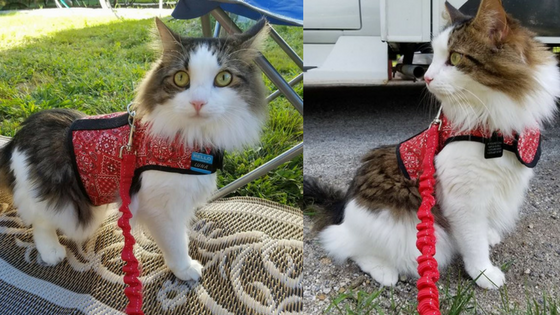 He was a bit nervous about living in an RV at first (who wouldn’t be?) and made sure to sniff everything. After sniffing around for about 30 minutes, Luna seemed to feel comfortable and even fell asleep on the couch! This made Bill and I extremely happy. Our doubts were put to rest and we became that much more excited. When Bill and I first left Pennsylvania (our home state) to venture up North, Luna was excited and anxious. We made sure to take our time with the trip and enjoy the views. Once we got to Maine, Luna was as happy as a clam. His house stopped moving and, to him, this could only mean one thing: walks outside! Before we took a walk, I snapped this picture of Luna. He looks beyond proud here. He should be proud of himself, too! He made it to Maine without meowing once! Hard to believe, I know. But, it’s the truth. I was so happy that he was adjusting this well. To reward him, Bill and I took him outside for a well-deserved walk. Needless to say, he enjoyed it. All was well! 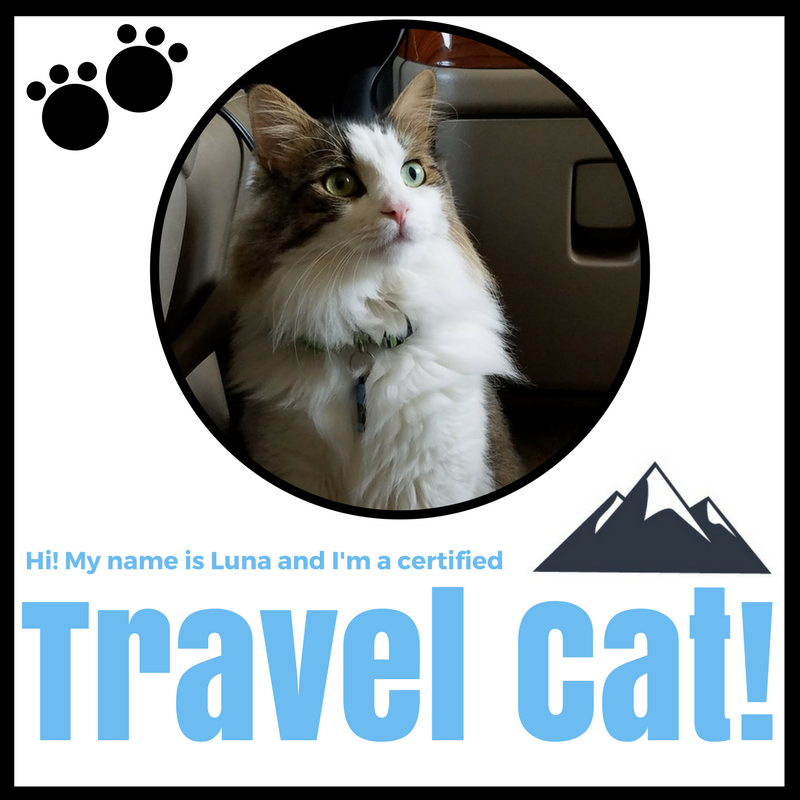 So, we’ve talked about Luna’s upbringing and how he became a travel cat, but there’s so much more to say about this lovable ball of fluff. For starters, he’s a huge cuddle bug. In fact, I’m pretty sure Luna could win an award for cuddling! He also loves meeting people. Luna loves making himself the center of attention and he’s cute enough to get it! The best part about this is that everyone who meets Luna falls in love with his personality. Almost all of our friends and family members ask us how Luna’s doing before asking how we’re doing! Apart from being a cuddle bug towards Bill and I (and being best friends with our family members and friends), Luna has a strong attachment to his sock monkey, Carl. 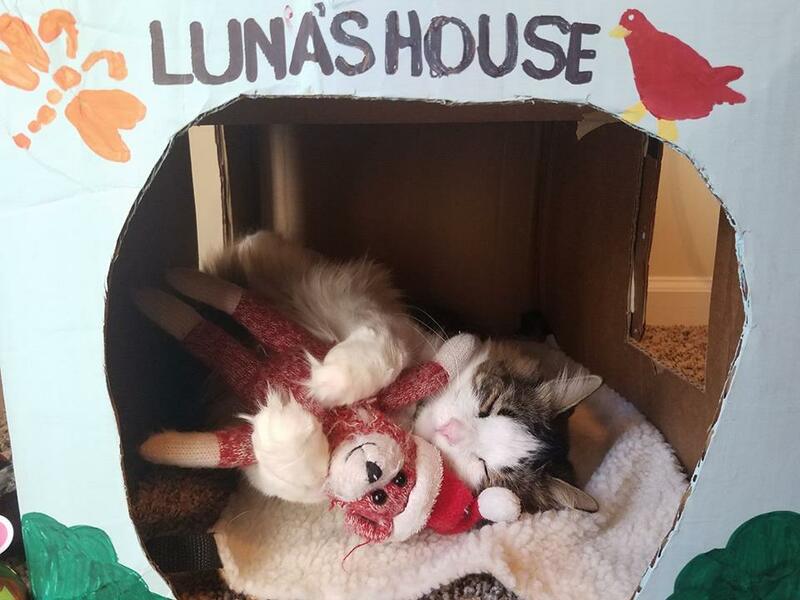 Carl was one of Luna’s first toys. He became much more than just another toy in Luna’s eyes, though. Luna takes Carl with him absolutely everywhere. He picks Carl up in his mouth and literally carries him from room to room. There have been a few times where Luna brought Carl into the bathroom with him, too. I’ve witnessed Luna place Carl in front of his litter box, do his business, and then pick Carl up and leave the room with him. Just because Luna has an attachment to Carl doesn’t mean he ignores his other toys, though. In fact, Luna is a toy monster! He loves sleeping the day away! Whether he’s on the floor, on a bed, on a chair, or on a pillow, if he’s comfortable, he’ll sleep. He’s such an angel when he sleeps, don’t you agree? Luna’s also very photogenic. 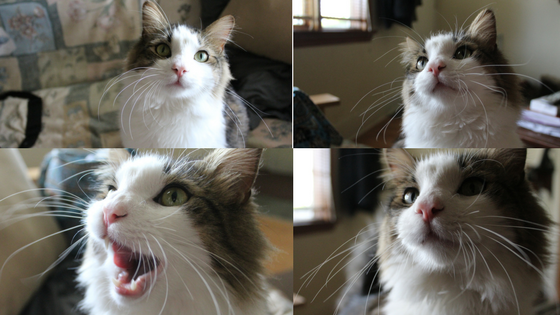 Even his “bad” pictures look adorable! I could show him off to everyone. Friends, family, even strangers on the street! Luna loves the attention, and I love showing him off. We make the perfect team! So, this one might be a bit funny to look at, but it’s one of the best things about Luna. He doesn’t mind when you dress him up! Halloween is his second favorite holiday (we’ve come to the conclusion that Luna loves Christmas. He’ll lay on the tree skirt, try to open his gifts before Christmas day, and bats the ornaments off of the tree). Okay… so, the first picture might be misleading. He did enjoy wearing that pirate hat, but he was not in the mood to wear it as soon as I got home from work. I couldn’t help it, though! Bill’s mom bought Luna a pirate outfit and when I got home I was so excited to put it on him. He eventually got used to it (and was rewarded with a few treats and walk outside afterward). 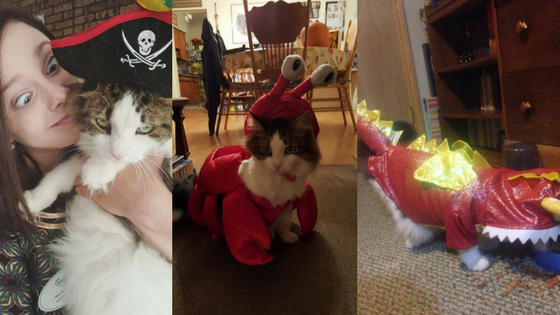 My personal favorite costume for Luna is the dragon. He didn’t make a fuss when we put it on him and he went about his day like he normally would! I could sit here for hours upon hours talking about Luna, but… it’s time to wrap things up. Just like any person can travel, any animal can travel. 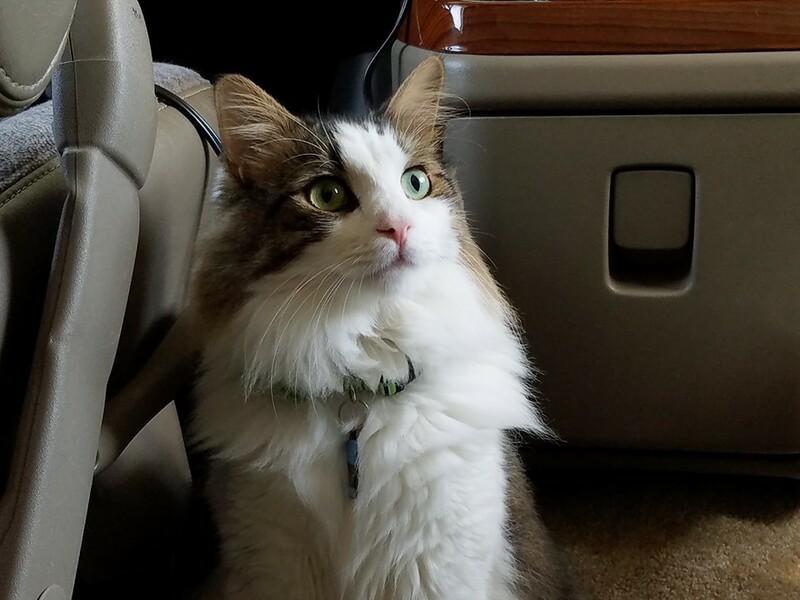 That said, however, it’s important to know all about your furry little pets before taking them on the road with you (even if it’s for a short vacation). 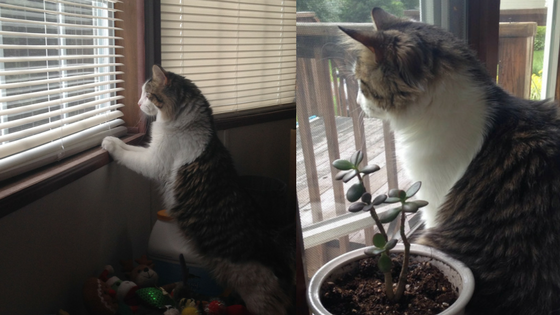 It takes time to learn what your animal will react to outside. Will they run away at the sound of a car? Will they chase after birds, mice, or other animals? Are they going to walk a few miles with you or a few steps? Luna is turning four this August. Since he was about one and a half, Bill and I have been leash training him, observing his every move, and we constantly learn new things that Luna does outdoors. Leash training isn’t hard! 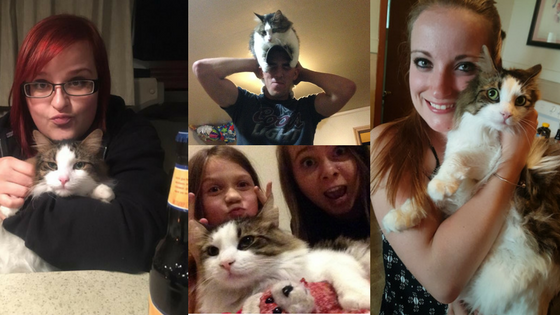 If you’re interested in learning how to do it, check out this article written by Adventure Cats. You must be patient, calm, and understanding with your pet. The great outdoors might frighten them at first! 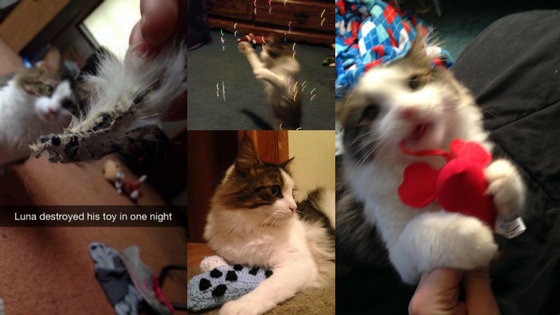 Luna brings joy to our lives and we wouldn’t want any other cat to come with us on our adventures. Thank you all for taking the time to read this, we hope that you enjoyed hearing Luna’s story! This won’t be the last you’ll hear about Luna. Just like Bill and I have a lot on our minds, Luna has a lot on his. This travel cat has something to say, but you’ll have to stick around to hear it! That’s amazing!! Congrats on the move! What made you decide to full-time? And it’s our pleasure! So glad we could help. Happy camping!